Making custom duck decoys can be accomplished in two ways: carving them out of wood or casting them out of a mold. The latter will allow you to produce decoys much more quickly. 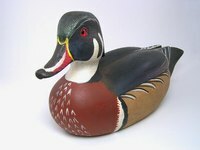 You will begin with a duck decoy that you want to re-create, then make a two-part mold of it, out of which you can create as many copies as you want. Be sure that the parting line is drawn along the exact center of the decoy. If the decoy already has a seam line from a manufacturer, you can just follow it. Fill in any deep feather patterns with a bit of water-based clay. The smoother the surface, the easier it will be to remove the mold. Light texturing is fine, but if you can hook a fingernail under a surface detail, it must be filled in. Attach a four-inch section of wooden dowel to the bottom of the decoy with hot glue. It should be centered across the parting line and extend away from the decoy. This will eventually form a channel that you can pour casting material into. Set the decoy on its side and prop it up with a few lumps of clay. Begin laying slabs of clay onto the work surface, gradually building up a base of clay that is even with the parting line. This clay base should extend 1 inch past the surface of the decoy, with the dowel sticking out past the clay. The base will form the flat inner wall of the first half of the mold. Press a marble into the clay every few inches, creating divots. These will form keys that help the two halves of the mold lock together. Spray the decoy and clay with two thin coats of acrylic enamel spray to seal everything, then with two coats of dulling spray to prevent the cement from beading up on the surface. Cut the burlap into 4-inch squares. Mix a small batch of cement in a bucket, following the mixing ratio provided on the package. Brush the cement onto the duck and clay. You are creating a beauty coat, which will capture any detail in the decoy. The beauty coat should be 1/4-inch thick, extending all the way to the edge of the clay. Allow the beauty coat to dry until you can no longer scratch it with your fingernail. Mix a larger batch of cement, following the same mix ratio as before. If you are unsure of how much you will need, err on the side of too much. Dip pieces of burlap into the cement, then smooth them onto the mold. These will provide additional strength to the mold and prevent it from shattering if dropped. Build up three full layers of burlap squares, each one dipped in cement. Allow the remaining cement in the bucket to thicken, then spread it onto the mold. The mold should be 1 inch thick in all areas, so spread the thickened cement accordingly. Allow the cement to fully harden for one hour. Turn the mold over and peel off the clay. Leave the decoy and wooden dowel embedded in the first half of the mold. Brush a thin coat of petroleum jelly onto the cement mold wall extending from the decoy to prevent the second half of the mold from sticking to the first. Follow that with two coats of acrylic enamel spray and two coats of dulling spray. Make the second half of the mold in exactly the same way that you made the first. Allow the cement to fully dry once you have finished. Open the finished mold and remove the decoy and dowel.